Overall height with Pivoting base for ease of Servicing Windsock , including Stainless Steel Swivel Head and Arm with Galvanised Mast and Base sections for Marine or corrosive atmosphere applications. 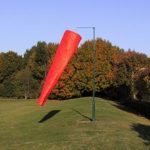 Suitable for flying Windsocks up to and including 4.27M/ 14 Foot. International Airport Size. Price ; £1140.00 Exc. VAT and Carriage.